Did you know? There are about 8000+ large enterprise hospitals in U.S. How is a hospital classified as a large enterprise hospital? Hospitals which have typically 500 or more beds are categorized as Large Enterprise Hospitals. They are capable of serving the whole population in the community by offering them wide range of services related to primary care and specialties. Some larger hospitals offer a combination of acute and long-term care services while also providing research opportunities in some cases and accommodating a variety of specializations. Considering the huge number of patients in such hospitals, the patient referral volume is also high. In order to improve patient satisfaction and retain patients within their network, a large enterprise hospital must have a seamless referral process. Below are the most common operational challenges that affect the patient referral workflow in large enterprise hospitals. Handling multiple EMR/EHRs – Large Enterprise Hospitals and Health Systems that are formed as part of mergers and/or acquisitions tend to handle multiple EMRs. They spend millions of dollars having to migrate from one EMR/EHR to another. It is also possible that if one EHR faces a down time, the entire patient referral workflow is affected. Data security in communication between multiple platforms is crucial to protect patient interests. In a merger or acquisition, patient experience must never be compromised despite the backend operational challenges that may occur. Seamless functioning between EMRs like Cerner, Athena Health, Greenway Health, Allscripts, Nextgen, etc is important. Training their staff – Staff in each division in the hospital might be comfortable with using a different EMR system. The user interface and familiarity affects speed of operations. The health system has to train and migrate all staff to a single EMR which costs millions of dollars and time to get the staff up-to-speed. Patient no-show rates – When patients miss/forget or do not show up for appointments, it results in revenue loss for the hospital. Patients miss appointments due to various reasons like no reminders, waiting time, better specialist within the locality, reputation of the receiving provider, etc. Referral leakage – Did you know? Referral leakage for large health system can average anywhere from 55-65%! Patient leakage or referral leakage occurs more in an out-of-network referral than in an in-network referral. 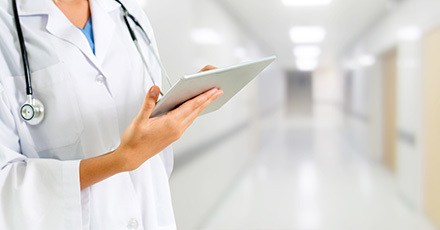 Enterprise hospitals use different systems to track out-of-network and in-network referrals. There could be many factors like reputation of provider, lack of knowledge or insight and patient’s choice that lead to patient leakage. Patient dissatisfaction – Large enterprise hospitals should keep in track of the number of patients moving out of their network. An alarming 25 to 50% of referring physicians do not know whether their patients see the specialist! Patients become dissatisfied with the treatment when specialists or PCPs do not follow-up with them regularly. Referral Analytics – As a large number of referrals flow in and out of the network, it is difficult to track the exact number. It is also tedious to track the number of referrals in various status, referral loop closures, percentage of referrals flowing in and out of network, referrals sent to different specialities, insurance provider, etc. In order to solve the operational challenges faced by large enterprise hospital, the process has to be improvised. This can be done with web-based referral management which will optimize patient satisfaction and care. Multi-channel referral consolidation – The HealthViewX solution can capture fax, phone, email, online form referrals or any other referrals in a single interface. It makes it easy to monitor and manage all channels of referrals in a single queue. Insurance pre-authorization process – HealthViewX automates the insurance pre-authorization process. The provider need not coordinate with the insurance company for prior authorization. The HealthViewX solution will do it for them. This reduces the manual effort of the referral coordinators. Patient coordination framework – After finding the receiving provider, the referral coordinator refers the patient. When the receiving provider receives the referral, the provider will get notified of the referral. Even the patient will be notified of the referral. The receiving provider can schedule appointments based on the patient’s comfort. This will cut down patient no-show rates. Timeline View to track referrals – With the help of a referral status, the referring provider can get to know what stage the referral is. A timeline view shows a history of stages through which the referral has progressed. The chances of a referring provider missing out on referral updates are very less. Referral closure and feedback – The referring provider can close the referral when it gets completed. The receiving provider and the patient can give a feedback on the referral process to the referring provider. Thus the referring provider can make it easy for the other the next time. Referral Analytics – Helps in tracking the number of referrals and gives complete information about the referrals processed, missed, scheduled etc with the help of a Referral Data-centric Dashboard. It can also be customized for different locations based on the priority of the enterprise hospital. HealthViewX Patient Referral Management solution smooths the referral process and solves most operational challenges for Large Enterprise Hospitals. Do you want to know more about HealthViewX HIPAA-compliant Patient Referral Management solution? Schedule a demo with us. This entry was posted in blog, Referral Management and tagged medical referral, patient specific, referral management, referrals on March 18, 2019 by Helena Nancy.